Well that's an Ultra edition if I ever saw one. Does it come with a seriyuu from the show as well? I haven't been buying many of these Gundam releases since there are just so many, but I have been expecting to get 00 when that was released, since it's probably my overall favorite non-UC Gundam (and maybe even favorite overall TV Gundam). Now that I know we're getting something special and with all the possibilities from the recent Japanese release, I'm especially excited for it... although if it's extremely expensive, I don't know that I'll be able to justify spending that much on Gundam 00. Been hoping for 00, my favorite of the franchise, to get a super fancy LE and hoo boy they definitely did not disappoint. Seems they pulled out all the stops for this release just from reading up on all those extras. Can't wait to see pictures of it and will definitely be preordering it when it goes up on Rightstuf. Just as I was expecting, Right Stuf is giving 00 the extra special treatment there just like what they did with Wing. It definitely is my choice for the best Gundam series, and I had such an amazing time watching it when it aired on TV. Seeing the LE overload that I didn't get Iron-Blooded Orphans or Wing, but it could be a different story with 00. The Japanese release has quite a lot of extra stuff, and I'm hoping that they get everything. Excellent, I will gladly pick up a LE for 00. Glad to hear we're getting it this year too. Hopefully G Gundam and Seed with its new dub are this year as well. There aren't many left for BD releases after that aside from War in the Pocket and X, are there? Gundam Build Divers Episode 1 will be available on GUNDAM.INFO from 19:00 (JST), April 3rd simultaneously as local Japan. Subtitle can be chosen in English, Korean, and Traditional Chinese (Taiwan)! Mobile Suit Gundam F91 will be available on GUNDAM.INFO from 12p.m. (JST), April 13th. Subtitle can be chosen in English, Traditional Chinese (Hong Kong and Taiwan) or Korean! Can't wait to see what the 00 Ultra Edition looks like. 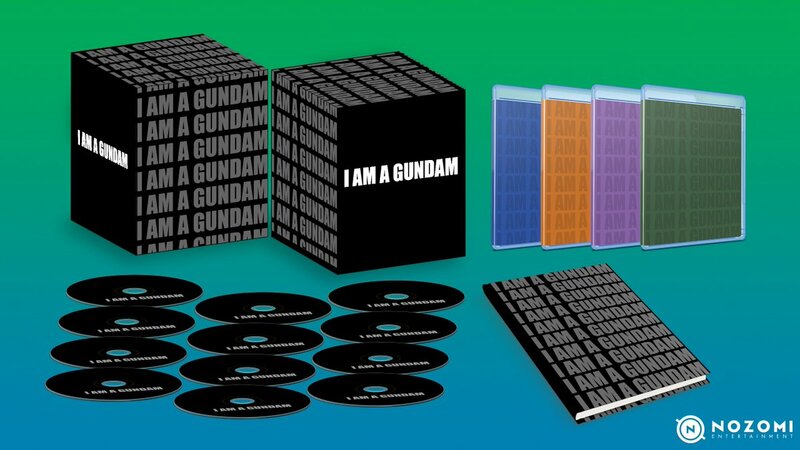 It definitely makes for a great April Fools joke to have I Am Gundam written on it a bazillion times, but it's quite obvious that it's just a placeholder until they can reveal it. I'm guessing that at Anime Central (which Right Stuf is going to) they will reveal the whole thing in all it's glory. Either there or at AX. Too early fro Gundam 0080 blu ray announcement you think? "Mobile Suit Gundam The Origin Ⅵ"　premiering May 5 on Hulu! Hulu unveiled their Spring 2018 anime simulcast lineup. "Mobile Suit Gundam The Origin Ⅵ　Rise of the Red Comet",　among the list, will launch on the service on May 5. Mobile Suit Gundam 00 Collection 1 contains episodes 1-25 and is directed by Seiji Mizushima. Special Features: Clean Openings, Clean Endings, Tactical Forecasts, Japanese Audio Commentaries, Gundam 00 "Daybreak's Bell" Promotional Video, and Gundam 00 Flash-like Chibi Short. Mobile Suit Gundam 00 Collection 2 contains episodes 26-50 and is directed by Seiji Mizushima. Special Features: Clean Openings, Clean Endings, Tactical Forecasts, Japanese Audio Commentaries, and Gundam 00 2nd Season Flash-like Chibi Short. Mobile Suit Gundam 00: A Wakening of the Trailblazer Movie Blu-ray is directed by Seiji Mizushima. Special Features: Promotional Videos, Movie Trailer, TV Guide, and Gundam 00: the Movie Chibi Short. Mobile Suit Gundam 00 Special Edition contains episodes 1-3 of the Mobile Suit Gundam 00 OVA Series. Special Features: Clean Endings and Gundam 00 Movie Preview Promotional Video. 12 Blu-rays; 235-Page Art Book; Fabric Poster; Haro Metal Keychain; Car Magnet. Finish your Gundam AGE collection with the OVA Memory of Eden this July! The Mobile Suit Gundam 00 Ultra Edition releases this September! Due to fan requests, the box will be sized to Blu-ray dimensions to fit on your shelf! This Ultra Edition is exclusive to @animetoday. Mobile Suit Gundam 00 is coming to Blu-ray and DVD starting this July! Last edited by WTK; 04-07-2018, 05:26 PM. Last edited by WTK; 04-07-2018, 05:55 PM. How much is the Gundam 00 Ultimate Edition with Got Anime?